Attorney Neal D. White, Jr. is a Partner in Cramer & Anderson’s Litchfield office whose practice focuses on Estate Planning, Probate & Trust Administration, Elder Law, Residential & Commercial Real Estate, Business Law and Tax Law. Estate Planning and Elder Law are important areas for Attorney White, who compassionately guides clients, families and spouses through issues that can be intricate and emotionally challenging. Estate Planning focuses on issues of taxation, preservation of assets and asset management. Attorney White helps clients navigate estate planning laws to plan for the future based on their individual needs and goals. The process includes identifying when trusts are necessary, and what type of trust is appropriate, as well as managing trusts. In drafting estate planning documents, Attorney White considers options that will best protect clients’ assets in light of Medicaid rules and state and Federal statutes. He has long experience in drafting wills, living wills, durable Power of Attorney documents, and health care directives. Elder Law and issues surrounding long-term care continually evolve. Attorney White assists families with issues related to housing, care facilities and accessing state and federal benefits for long-term care, and also has experience with special needs planning and individually-tailored conservatorships and guardianships. 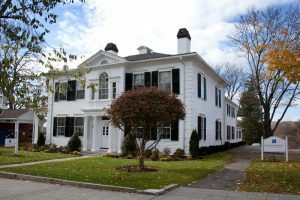 Attorney White also handles residential and commercial real estate transactions, including purchases, sales, refinances, and reverse mortgages, along with more complex issues ranging from environmental issues and potential pitfalls contained in municipal land-use regulations to protective contingencies that should be placed in contracts. As the lead partner for business and corporate law in the Litchfield office, Attorney White assists business owners with the formation of limited liability companies, corporations & partnerships, and counsels businesses of all sizes on transactions, employee and personnel issues, mergers and acquisitions, and issues of governance and operation. His clients also include not nonprofit organizations. Tax Law for Attorney White involves all issues arising from the application of state and federal tax laws to individuals and businesses, as well representing public and private clients in property tax assessment appeals involving the municipal valuation of real estate or personal property. Attorney White brings to those practice areas invaluable experience as a CPA and former corporate tax consultant for both KPMG and Pricewaterhouse Coopers. Attorney White lives in Goshen with his wife, Gina, and their family. A lifelong resident of Litchfield County, he grew up in Litchfield and graduated from Litchfield High School in 1989.